A new book from Chiu Yin Hempel, award-winning author of Tuxedo Park: The Historic Houses and Tuxedo Park: Lives, Legacies, Legends - Illustrated with over 200 original color photographs by Greg Miller. 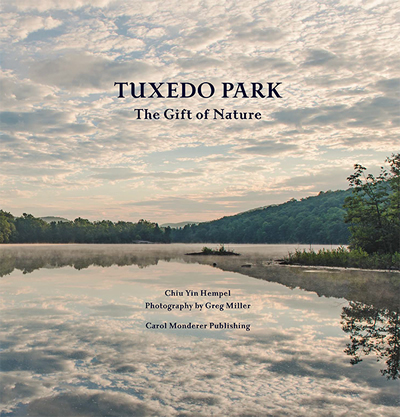 Tuxedo Park: The Gift of Nature tells the story of how conservation-minded community development, nature, and extraordinary biodiversity have changed the landscape in this historic village, located only 45 miles north of New York City. Tuxedo Park is home to more than 450 species of trees and plants, 150 species of butterflies and moths, and nearly 200 species of birds, mammals, reptiles, and amphibians. Its lakes and feeder streams teem with life year round. Founded in 1886, Tuxedo Park is listed on the National Register of Historic Places. Nature in Tuxedo Park appears almost untouched by man. However, over 100 years of conservation-minded community development has been responsible for the village's continued ecological health and unspoiled beauty. This exquisite environment is now given a voice in Tuxedo Park: The Gift of Nature, revealing the gifts that Mother Nature has passed down since time immemorial. The book is the third volume in an illustrated trilogy about the historic community of Tuxedo Park, New York. The others are Tuxedo Park: Lives, Legacies, Legends and Tuxedo Park: The Historic Houses. All sales proceeds benefit two not-for-profit community organizations: Tuxedo Park Fire Department and Tuxedo Park Library. The book is available for sale at the Tuxedo Park Library.